This Bookreporter.com Special Newsletter spotlights a book that we know people will be talking about this spring. 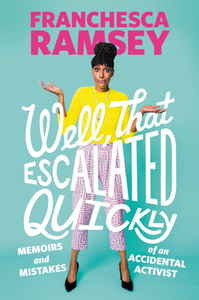 Read more about it, and enter our Spring Preview Contest by Friday, April 20th at 11:59am ET for a chance to win one of five copies of WELL, THAT ESCALATED QUICKLY: Memoirs and Mistakes of an Accidental Activist by Franchesca Ramsey, which releases on May 22nd. Please note that each contest is only open for 24 hours, so you will need to act quickly! In this sharp, funny and timely collection of personal essays, veteran video blogger and star of MTV's "Decoded" Franchesca Ramsey explores race, identity, online activism, and the downfall of real communication in the age of social media rants, trolls and call-out wars. Franchesca Ramsey didn't set out to be an activist. Or a comedian. Or a commentator on identity, race and culture, really. But then her YouTube video "What White Girls Say...to Black Girls" went viral. Twelve million views viral. Faced with an avalanche of media requests, fan letters and hate mail, she had two choices: Jump in and make her voice heard, or step back and let others frame the conversation. After a crash course in social justice and more than a few foot-in-mouth moments, she realized she had a unique talent and passion for breaking down injustice in America in ways that could make people listen and engage. In her first book, Ramsey uses her own experiences as an accidental activist to explore the many ways we communicate with each other --- from the highs of bridging gaps and making connections to the many pitfalls that accompany talking about race, power, sexuality and gender in an unpredictable public space...the internet. - Visit Franchesca Ramsey's website, blog and YouTube channel. - Connect with Franchesca Ramsey on Facebook, Twitter, Pinterest and Instagram.